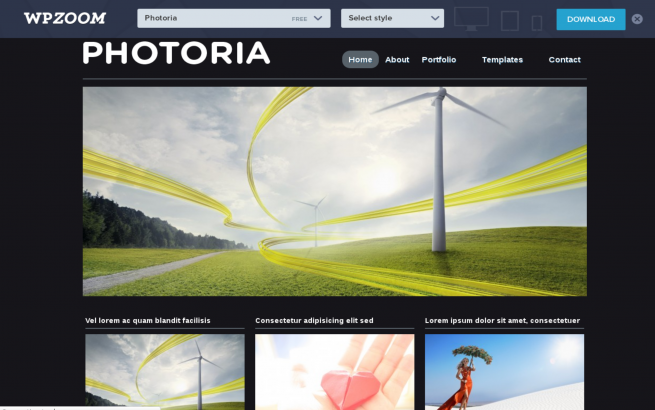 Photoria is a free WordPress theme for your Photoblog or Portfolio website. Photoria simple and stylish free WordPress theme. Photoria has custom menu, you can add pages, categories, custom links and create drop-downs via drag. Free WordPress theme comes with several custom widgets for Sidebar and Footer. Photoria has easily configurable gallery slider on homepage which allows you to showcase your featured content. This theme has built-in 2 additional templates for your pages. Photoria is a one of the best free WordPress theme.